The USA played their first-ever T20I on Friday. 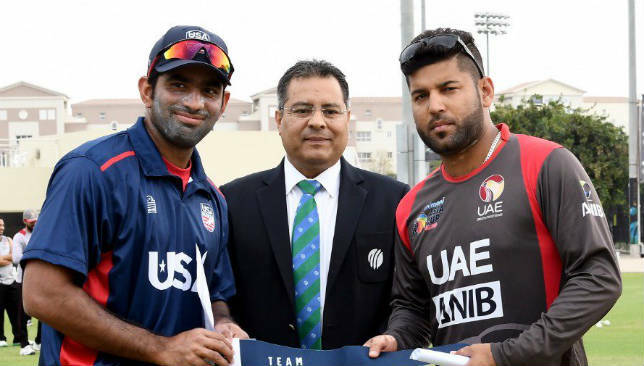 UAE have won the toss and elected to bat in the second T20I of their series against the USA at the ICC Academy in Dubai. After rare desert rain played spoilsport in USA’s first-ever T20I – or, saviour, from the UAE’s perspective – the two sides meet again in the second and final match of the series on Saturday. The USA were on their way to a historic victory on Friday when the rain intervened, having made an impressive 152/7 from their allotted 15 overs, thanks largely to Steven Taylor’s 72 off 39. In response, chasing an adjusted target of 143 runs from 13 overs, the UAE had stumbled to 29/2 from 3.3 overs. The par score for two wickets down after five overs, the minimum required for a match to be declared official, was 51, so the UAE would have needed some stunning hitting to avoid defeat. Instead, all they needed was a downpour. That sets the series up nicely for Saturday’s decider. Follow the game with our live scorecard. UAE team. Image: Emirates Cricket Board/Twitter. The UAE host the USA on Friday at the ICC Academy in Dubai in a match that will be the USA’s first-ever T20I. The two-match series kick-starts the preparations for the T20 World Cup qualifiers for both teams, with the UAE and US set to play in regional qualifying tournaments later this year in a bid to reach the final qualifying tournament in the UAE that begins in October. For the USA, former West Indies Test batsman Xavier Marshall has been recalled to his adopted country’s T20 squad after being left out for the previous three squads at the end of last year. Follow the match with our live score updates. Shikhar Dhawan returned to form with a superb ton. Shikhar Dhawan’s 16th ODI century led India to a stiff total of 358/9 in the fourth ODI against Australia at Mohali. Dhawan brought up his ton off 97 balls while sharing a 193-run opening stand with Rohit Sharma, who was out for 95. Despite the disappointment of Sharma missing out on a century of his own, India will welcome the return to form of both their openers after a lean patch, with Dhawan finishing on 143 off 115. The duo went past the partnership of Sachin Tendulkar and Virender Sehwag to become the second-most prolific opening pair for India, while their 15th century stand takes them to within one of Matthew Hayden and Adam Gilchrist for second-most 100-run partnerships by an opening pair. KL Rahul, making a comeback to the side having last played an ODI last September, came ahead of skipper Virat Kohli, but could only manage 26 off 31 in a stop-start innings, while Kohli, batting in the unfamiliar position of 4, suffered a rare failure. Cameos for Rishabh Pant, in for the rested MS Dhoni, and Vijay Shankar, helped India set a target of 359, though they may wonder if they could have managed a bigger score, with 400 looking on at one stage. Nonetheless, Australia face a tough task to level the series heading into the fifth match in New Delhi. India made four changes to the XI that fell short of wrapping up the ODI series against Australia on Friday, as Kohli won the toss and elected to bat. India, who are 2-1 up in the five-match series having lost on Friday, also reshuffled their bowling attack, bringing in leg-spinner Yuzvendra Chahal for left-armer Ravindra Jadeja and swapping seamer Mohammad Shami, who suffered a minor knock in the last match, with Bhuvneshwar Kumar. Australia were also forced into a change thanks to a hand injury for Marcus Stoinis, bringing in Ashton Turner in his stead. Stoinis’ absence weakened the pace attack, and thus off-spinner Nathan Lyon was dropped to accommodate Jason Behrendoff.